NASA managers attending an executive-level flight readiness review Tuesday formally cleared the shuttle Endeavour for launch April 29 on its 25th and final mission, a four-spacewalk flight to deliver supplies, spare parts and a $2 billion particle physics detector to the International Space Station. Bill Gerstenmaier, chief of space operations at NASA headquarters in Washington, said the vote to proceed with the 134th and next-to-last shuttle mission was unanimous. "We reviewed everything," he said. "We're ready to go fly." Endeavor commander Mark Kelly, pilot Gregory Johnson, European Space Agency flight engineer Roberto Vittori and spacewalkers Andrew Feustel, Michael Fincke and Gregory Chamitoff will fly to the Kennedy Space Center next Tuesday for the start of the shuttle's countdown to launch. Liftoff is targeted for 3:47:49 p.m. EDT on April 29, roughly the moment Earth's rotation carries launch complex 39A into the plane of the space station's orbit. It is not yet known whether Kelly's wife, Arizona Rep. Gabrielle Giffords, will attend the launching or if so, when she might arrive. Giffords is recovering from a gunshot wound to the head and her medical team in Houston has not yet indicated whether her condition will permit travel. In any case, Endeavour's initial launch window opens April 29 and extends through May 4. If the shuttle is not off the ground by then, the team will stand down for three days to reload liquid oxygen and hydrogen fuel cell reactants and to give the Air Force time to launch an Atlas 5 rocket carrying a military communications satellite. The shuttle launch window would re-open around May 8 and extend through May 29. NASA had planned to launch Endeavour on April 19, but earlier this month the fight was delayed 10 days because of a conflict with the launch and docking of a Russian Progress supply ship. The delay put the shuttle launch on the same day as the British royal wedding of Prince William and Kate Middleton. Asked if NASA considered an additional delay to avoid a conflict with the royal wedding, Gerstenmaier said "We work beta (angle) constraints and we work launch range constraints. I haven't yet put on our manifest charts 'wedding constraints.' So we didn't factor that into our thinking." Assuming an on-time liftoff, Kelly plans to guide Endeavour to a docking at the space station's forward port around 1:30 p.m. on May 1. The $2 billion Alpha Magnetic Spectrometer, designed to sift high energy particles from deep space to look for antimatter and clues about the formation and evolution of the universe, will be attached to the lab's power truss the day after docking. Four spacewalks are planned for May 3, 5, 7 and 9 to carry out a variety of maintenance chores. Undocking is scheduled for May 11 with landing back at the Kennedy Space Center around 9:30 a.m. on Friday, May 13. If there are no major problems, however, mission managers hope to extend the flight an additional two days, giving the shuttle crew time to help with needed maintenance. "We're going to lift off with a 14-day planned mission," said Mike Moses, the shuttle integration manager at the Kennedy Space Center. "We have two extension days in addition to the two weather and systems wave off days that we keep for deorbit and landing contingencies. So we have two mission extension days this time. "After we get docked to station, probably around flight day five or so, the mission management team ... will take a look at where we're at. The mission ops team has a really good plan where those two extra days will go in and we'l probably add those two days, taking it to a 16-day mission. But we won't do that until we get in orbit and see what we've got." Assuming the extension days are approved, landing would be expected around 8:40 a.m. on May 15. Whenever it gets back, Endeavour will be "safed" and decommissioned before work to ready the orbiter for permanent display at the California Science Center in Los Angeles. The shuttle Discovery, which completed its final mission in March, already is undergoing that process before its eventual display near Washington at the Smithsonian National Air and Space Museum's Steven F. Udvar-Hazy Center. 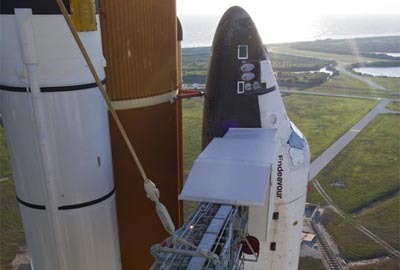 NASA plans to follow Endeavour's flight with a final launch by the shuttle Atlantis on June 28. The goal of that flight, the orbiter's 33rd mission, is to deliver a final load of needed supplies and equipment to stock the station before the transition to unmanned resupply missions by smaller U.S. and Russian cargo craft. Atlantis will be put on permanent display at the Kennedy Space Center visitor's complex.